I nearly squealed when I saw that Junior Mints was celebrating Halloween with black and orange centers. This may be old news. Maybe the Tootsie Roll Co. has been making these for the last 16 years, but I don’t remember seeing them until recently. Sadly, these Halloween Junior Mints don’t have any special flavors. I feel like orange mint is a missed opportunity (I love orange mint), but points to Junior Mints to giving us bright orange and deep black gooey peppermint centers. Summer is winding down and that means the retail world is turning its attention towards Halloween (and even Christmas). What else does that mean? All kinds of seasonal candy for us to try! Do you like chocolate? Do you like caramel? Do you like apples? Do you like fun apple shape? Then Hershey’s (new?) caramel apple chocolates are just for you! I’m not a huge fan of Hershey’s chocolate. It’s okay, but it’s also whatever. And I don’t don’t like actual caramel apples, at all. The last time I had one was 25+ years ago, and I swore them off for the rest of my life when I found myself staring down a tiny green worm that poked it’s head out of the piece of apple I’d just bitten. Yuck! As for these? I’m actually enjoying them. Even more so than I thought. I figured it would be a fun seasonal candy and maybe getting through the whole bag would be a chore, but they’re actually pretty good. The chocolate mixes well with the apple flavoring of the caramel. I recommend this! New for the upcoming fall season as Cinnamon Apple candies from Hot Tamales. This is genius and I can’t believe we’ve never had this before. Everyone knows Hot Tamales. They’re chewy spicy candy, but throw in some apple flavors as well? Well, it certainly brings to mind cool autumn days and apple pie. The cinnamon portion is the typical Hot Tamale, while the apple portion perfectly balances out the cinnamon. I liked experimenting with the cinnamon/apple ratio. I think 1 cinnamon candy + 2 apple candies is the perfect formula for me. Just like the packaging, the candy itself is vibrant. Bright red, bright green. Hey, they could continue to sell this into the Christmas season if they like! If you’re a fan of Hot Tamales, this is definitely worth picking up. I’ve already bought two boxes and plan to buy more! Ah, gummy (or gummi, if you prefer) candy. 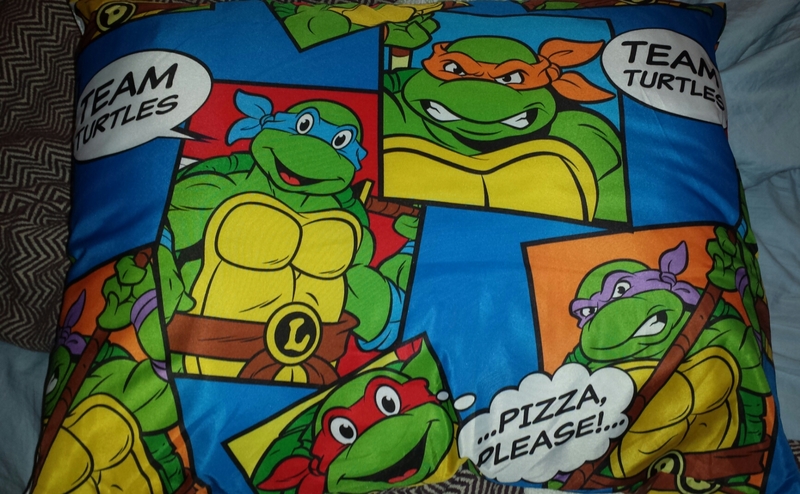 I’ve always had a soft and chewy spot for them in my heart. I would much rather have some type of gummy candy over chocolate or hard candy. I’ll talk about some of my favorites at a later date, but today it’s all about trying new things! Some people may not have a preference when it comes to what company makes their gummy candy. Well, I do. It’s Haribo for me or it’s nothing. Brands like Trolli and Black Forest (both owned by the Ferrara Candy Company) offer low-grade quality gummy candy. I used to work at a video store and we carried a number of Black Forest gummies: sharks, bears, dinosaurs, etc. They were disgusting. They were never fresh and they were so greasy you could see it rubbing off on the bag. 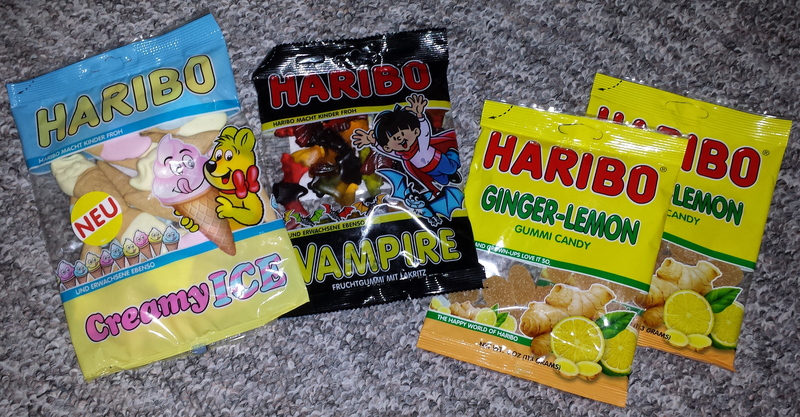 What’s really interesting about Haribo is that they have so many different varieties gummies. The sad thing is that I think many of them aren’t readily available in the United States. There’s quite a few you can have imported from European sellers through Amazon.com though! And that is how I got my hands on today’s Haribo products. I’ve been familiar with Muddy Bears with a few years but yesterday was the first time I’ve ever noticed Muddy Reindeer. They’re made by the same company: CandyASAP. The same people that make other junk food candy like Chocolate Chip Cookie Dough Bites, Fudge Brownie Bites and Care Bears Gummi Bears. CandyASAP is owned by Taste of Nature, Inc. and that brand has a huge line of organic nut-filled snack bars. Not sure why they added “Santa’s Village” to the name. I guess to make up for the very un-seasonal box art. I swear they swiped an image of the Rankin Bass version of Rudolph and recolored him in red, green and yellow. Side note, I created my own version of “Muddy Bears” long before I ever heard of the CandayASAP’s chocolate-covered gummy bear version. My take on it was gummy bears + vanilla ice cream + crushed Oreos (though I suppose you could cheat and go with cookies ‘n’ cream ice cream). I still prefer my version. As you can see, despite supposedly being in the shape of reindeer, you can’t really tell. I’m thinking they look more like bunnies. 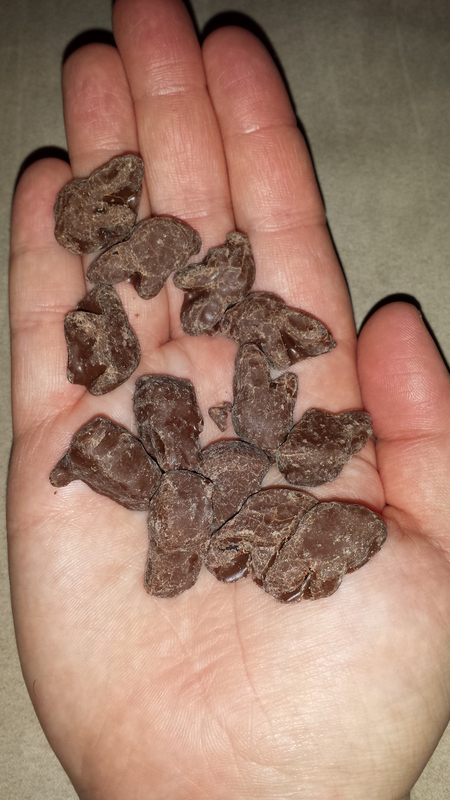 Or maybe even chocolate-covered crickets! 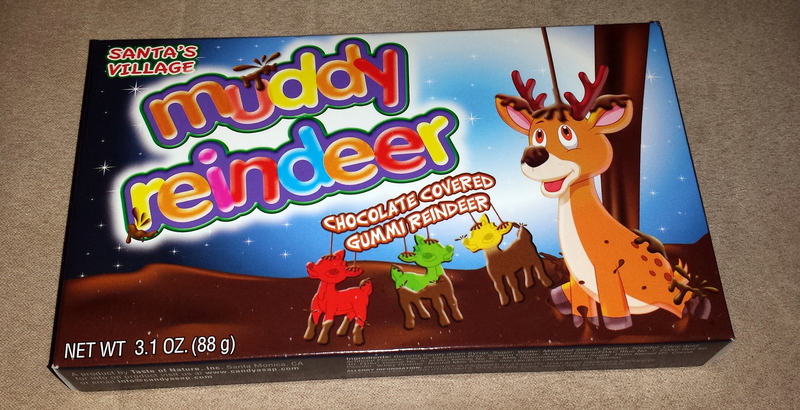 If you’ve ever had Muddy Bears, you’ll like Muddy Reindeer. And if you’ve never had chocolate-covered gummy candy, well, WHY NOT? Muddy Reindeer get two thumbs up from me. Now I’m waiting on Haribo to release a chocolate-covered version of their Gold Bears (the BEST gummy bears in the world). I don’t know why I keep punishing myself. 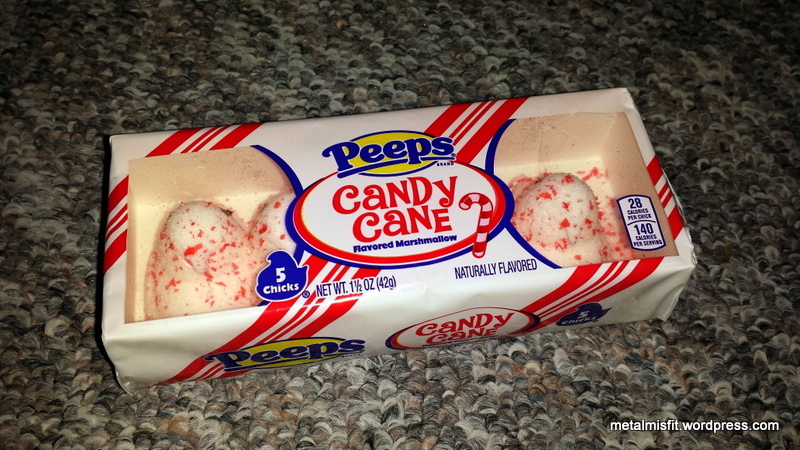 I am not a fan of Peeps, but like many people around the holidays, I get lured into eating all kinds of junk that I wouldn’t normally eat just because it has some festive gimmick flavor. Let me spare you the effort of buying them yourself and tell you that they are gross and don’t taste anything like candy cane or peppermint. They taste like regular Peeps. That is, cheap, rapidly dissolving marshmallows that have been rolled in sugar. They smell like peppermint though. Or at least the packaging does. When I sniff the Peeps themselves, they have no scent. Yet when I sniff the package, there’s definitely a Scope mint mouthwash aroma going on. This product fails because it doesn’t taste like candy canes, it doesn’t smell like candy canes and it’s Peeps.